Yelich and Betts are 100% locks, deGrom 99%--no point in polling those. This one's somewhat contentious, although I suspect Snell has a clear edge. Including more names than necessary--realistically, three or four would do. Snell -- he was so on in the final stretch and the number of games he won over that stretch was pretty nuts. People are gonna love those 21 wins but the 180 innings gives me a little pause. i'd have to drill down and don't have the time. The WARs differ on Snell. If I cared about polls I'd think NL MVP is up for debate. Yelich is a lock for Dumb Sportswriter Tradition reasons, aka Player With the Best Teammates. He almost won a Triple Crown, which involves two important categories that have nothing whatsoever to do with his teammates. In September, his team went 19-7, to emerge as the division winner when they could just as easily have missed the playoffs; Yelich went .370/.508/.804 during that stretch, with 10 HR and 34 RBI. There may have been...what's that word again?...there may have been some causation going on there. Snell should win this -- his ERA+ is higher than anything Kershaw ever put up save for one shortened season when he threw less than 150 innings. But it will be a very interesting vote. Would you rather have a very good AND durable SP or one who is dominant for 2/3rds of the season? If Sale wins, will great SP routinely win the CY with 150-170 IP? Starter innings continue falling, so this might be inevitable in the next ten years either way. WAR doesn't properly address durability -- it assigns the same value whether you put up 6 WAR over 2/3rds of a season or a full season. But "roster certainty", for lack of a better term, matters in the real world. Health is a skill, not having to scramble to fill roster spots for injured players makes running a team easier, knowing who will be available in September and in the playoffs, all of these things provide value to a team. I think those two comments amount to drilling down for you. That drilling down comment did make me laugh. In all the time I've been on here, I can't remember you ever assembling a bunch of numbers to back up something you've said. Not once. (And if I'm wrong, please provide a link and I'll take the comment back.) You assert things all the time. As far as I can tell, drilling down in your case amounts to clicking on Fangraph's WAR leaderboard, clicking on some other site for a few minutes, then going back to Fangraph's WAR leaderboard for a second look. In other words, "No--I've never actually backed up anything I've ever said on here; it's all second-hand." Don't forget to include some of your funny spellings in your reply--"sez," "wrrrrong," that kind of thing. That never gets tired. Something else you regularly do: make a ridiculous, unsupportable statement, get called on it, and run to the second-thoughts thread. You seemed to suggest just above that I have some kind of Academy Awards fixation. I stopped taking the Academy Awards seriously in 1980, and except for a handful of specific nominees, haven't cared who wins or doesn't win for just as long. If I have nothing to do the night of the show, I may watch some of the broadcast. Meanwhile, you start Academy Awards threads--one, two, three, four. There's a disconnect there. Bauer has an interesting case, though, although 12 wins and so many other plausible candidates means i doubt he'll crack the top 5. buuuut he was second in the league in ERA (2.21), and there's just as much space there between him and Snell (1.89) as the third place (Verlander, 2.52). but Bauer led the league in FIP (2.44), with Snell down in fifth at a still-elite 2.95. by xFIP they come out about the same. their strikeout, walk rates are about the same. Ditto. For three or four years, I ignored all the idiotic stuff you misattributed to me. I won't anymore. If you act civil--which you were doing a pretty good job of for a while--or, better yet, just don't engage at all with me (overtly or implied), we won't have a problem. As always, I want to look at game logs before deciding who had the best year. I think this year, in the AL, that might really make a difference. Snell was phenomenal, but I suspect he really threaded the needle on a lot of under-seven-inning starts. So the things NoTime posted above, but applied to Snell vs. Verlander/Kluber. When I go through game logs, I like to look at the most basic thing of all: how many times did a starting pitcher give his team a good chance to win the game? The quality start isn't very useful, because it lets in games where a guy gave up three runs. You could call that quality in the PED-era, but making your team score at least four runs to win a game today doesn't seem like anything special. Then you have to decide where to set the inning bar, and that's where Snell's season becomes tricky. Snell only went 7 innings seven times this year, and all seven times he gave up two or fewer runs. If you drop the inning requirement to 6, Snell moves all the way up to 19/31--he had 12 starts of 6/6.1/6.2 innings where he pitched very well. But Verlander moves to 23/34 (Kluber to 18/33...and deGrom, 23/32). So...When I complained about the way Counsell used his starters, the general feeling around here seemed to be that that's the game now, get used to it, the days of starters pitching into the seventh are gone. (Or maybe just in the postseason, I don't know.) If that's your viewpoint, I think you can make a case for Snell, but even there, Verlander's even better--he had 13 starts of 6/6.1/6.2 where he gave up two or fewer runs. If you use the seven-inning threshold, Kluber's the best. Snell will probably win, and if you don't dwell on the IP, it's not difficult to lay out the case for him. Game logs would give me pause...but truthfully, I still don't know what the right answer is (and I haven't even included Sale; with at least three other really good candidates, I can't see voting for a starter who fell short of 162 innings). Doesn't compare with the others--and, again, because of the injury, he didn't pitch six innings or more after July 27.
i totally agree that other things being equal, more innings is better, but snell can only pitch the innings his manager allows him to. and what if the extra innings aren't that good? verlander had a 4.60 ERA in the sixth inning this year and a 4.85 ERA in the seventh. maybe letting him pitch 33 more innings than snell actually hurt his team. that's something of an outlier -- the other guys we're discussing got worse, but not by so much -- but while your seven-inning/two-run benchmark feels nice on a per-game basis, it's just as arbitrary as celebrating the guys who hit the 17-homer/23-steal mark. we have stats that better capture players' contributions. verlander and snell are similarly dominant the 2nd time through - wOBA in the .230 range. they're also similarly much worse the 3rd time through - .wOBA around .310. the difference is that verlander's manager kept him in for 51 innings, while snell's manager pulled him earlier. verlander had a 4.60 ERA in the sixth inning this year and a 4.85 ERA in the seventh. maybe letting him pitch 33 more innings than snell actually hurt his team. That's a great point. I feel like the AL Cy Young this year does reflect something about the way things are changing. How did Kluber fare there? anyway, i still have no idea who should win. i'd say probably NOT snell, though, especially looking at how lucky he was the first time through the order (1.01 ERA vs a .218 wOBA). he was very, very, very good first time through the order, but so was gerrit cole, and he gave up twice as many earned runs. So Kluber was clearly stronger than Snell or Verlander the deeper he got into the game. Which just scrambles everything up a little more. I'd disregard Kluber for his division. Twelve of his starts were against the White Sox, Royals, and Tigers -- three of the four worst AL offenses. FWIW Snell faced the Red Sox 4 times, Yankees 3. Indians and Astros twice. Blue Jays three times but whogivesafuck. Took another stab at this with the top 3. Verlander and Kluber pitched more innings because they pitched more games, not because they went deeper into games--they only threw 14 innings between the three of them after the 7th inning. Verlander pitched the best, but you're looking at 4.2 innings. Hardly seems worth noting--just like everyone else, they're all seven-inning pitchers, more or less. Verlander led the league in combined WAR (BR/Fangraphs), WHIP, strikeouts, and K/BB. Kluber led the league in BB/9. Verlander and Kluber threw one shutout each, Snell had none. I guess it comes down to Snell's ERA+ vs. Verlander's K/BB, and how much credit you give to Verlander for the extra 30 innings (again, a function of pitching more often, not pitching deeper into games). So I still have no idea. It's a coin toss. Either one is fine. The point above about strength-of-opposition seems worth looking into in a close contest. oppTAv is opponent's True Average, a measure of total offensive value scaled to batting average. Adjustments are made for park and league quality, as such the league-average mark is constant at .260.
oppRPA+ is the opponent's player's runs per plate appearance, relative to the league average - 100 means average, 120 is 20% better than average, etc. PPF is Pitching Park Factor. 100 is average, above 100 is a higher run scoring environment, below 100 is a lower run scoring environment. there. that makes a lot more sense. How many inherited runners scored: I don't think Baseball Reference has this data...does someone keep track of it? The quality-of-competition data looks fairly even to me: Snell (.253/.320/.423), Verlander (.247/.318/.421). Snell's opposition was a little better, but a few percentage points over a couple of hundred innings can't mean that much, can it? One obvious explanation: many more GIDP for Snell (Snell had a 15-3 advantage in ~35 fewer innings). Sabermetrics gives credit to the defense there, right, not the pitcher? So 1) Verlander was better at not allowing baserunners, and 2) he struck out more batters, but when people were on base, Verlander 3) gave up quite a few more home runs, and 4) Snell (or his team) started a lot more double plays. I don't know what the prevailing wisdom is, but I wouldn't be that confident in saying Snell was just a lucky bystander in all those double plays. He definitely wasn't a lucky bystander in not giving up the extra 12 home runs. "Bequeathed Runners Scored"--I'd like to see this data before I cast my vote. If that were to show that Snell clearly got a lot more help from his bullpen in cleaning up what he'd left behind, I'd consider voting for Verlander. If not, I'll go with what I wrote in the previous post and vote for Snell. I bequeathed my vote to Snell. Murky, but I think he was the best (with the possible exception of Sale). Anyways - right guy won! I almost wonder if someone hit the wrong Blake button. Not that he didn't have a great season--more or less as good as Gagne's big year--but those days are gone forever, right? The real vote may be just as close as this one. If you were to go by this piece (different writers, mind you), I'd look for Verlander to win today. wow, Blake Snell won! honestly didn't expect that. barely beat Verlander (169 to 154). 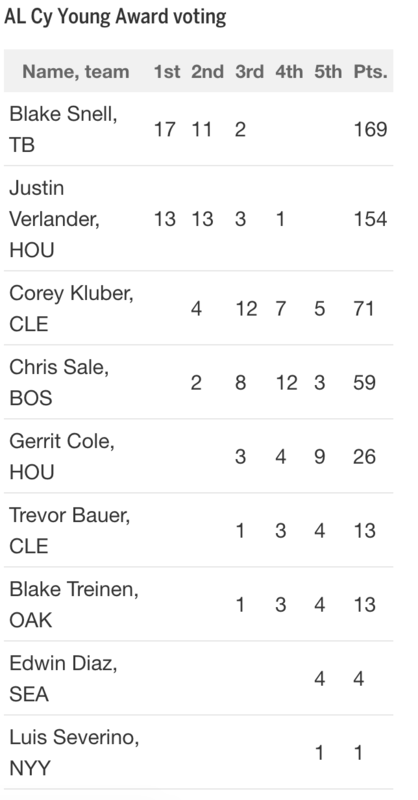 Kluber in 3rd with 71.
i was expecting Verlander to win too; but am pleasantly surprised ol' Snelly Cat got the votes! The actual vote is basically identical to ours proportionally. Do the same writers vote for each league? I hope so--it will spare us whining about how Snell won because of his wins. I didn't think it was the same voters...The two Cy votes seem fairly consistent to me, although with deGrom and Scherzer, you're looking at tiny margins. Scherzer and Verlander had more innings, better WHIPs (in those two categories, Scherzer and deGrom were essentially tied), and had the flashy strikeout seasons; deGrom and Snell had big ERA advantages and pitched for lesser teams. Chris Sale is the only pitcher ever to finish in the top 5 in AL Cy Young Award voting in 6 consecutive seasons (2013-18). The only other pitchers to do that in either league are Greg Maddux (7), Clayton Kershaw (7), and Roy Halladay (6). Sale also finished 6th in 2012. You can add Scherzer to that list too; 1st/5th/5th/1st/1st/2nd.